Suresh Raina, the Indian Cricketer slams the fake news report on Social media regarding a car accident and his death. 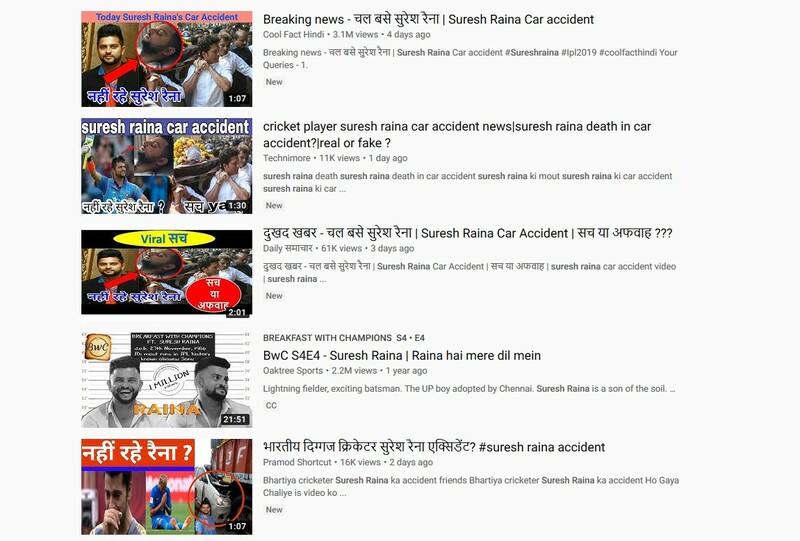 There are many videos and news report on social media spread virally that cricketer Suresh Raina passed away in a road accident. The cricketer responded to the rumors today and slammed all those fake reporters and YouTubers via Twitter. The tweet goes like, “Past few days there has been fake news of me being hurt in a car accident. The hoax has my family & friends deeply disturbed. Please ignore any such news; with god’s grace I’m doing absolutely fine. Those @YouTube channels have been reported & hope strict actions will be taken soon,” he tweeted. It was strange as when someone searches Suresh Raina in the Youtube, all these hoax videos show in Google and Youtube. There are many videos uploaded by YouTubers claiming that Raina passed away in a road accident with severe injuries. Finally cricket fans are happy on seeing he is live and safe in his home. Let the cricketer make his comeback to the Indian team, Rest in Peace haters who spreading fake viral news on social media. Next articleWhy oiling your hair is necessary?